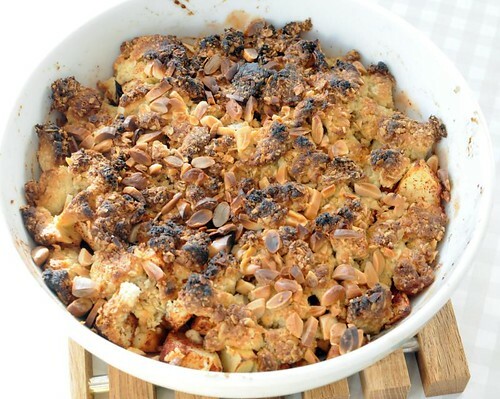 Swedish apples are finally really in season, and while I know - in theory - that there's so much you can do with them, I usually just opt for a simple crumble. After all, why mess with perfection? However, I rarely try the same recipe twice, and this one was new to me, using almond paste and almonds. It's lovely - but the almonds burn real easily (as you can see in my photo) so beware! Peel and slice the apples, and place in a pie dish. Toss with sugar and cinnamon. Place the almond paste, butter, oats and flour in a bowl, and pinch with your fingertips until it forms crumbs. Put this on top of the apples. Coarsely chop the almonds and sprinkle on top. Bake at 200°C for about 20 minutes. Serve with vanilla custard or ice cream.